Yes, my friends! Today is the day that I unveil the first book of my brand new series! Meet FIRST FLYGHT, the first book of the Flyght Series. I’m so excited for this series. It’s been a lot of fun to write and dream up, and it’s another science fiction romance which I love to write. The original idea came to me for this series about two years ago. I really wanted to write something that reminded me of Firefly, a long tale about a starship captain and her crew. I would gender-flip it so that the crew was heavier with women than men, and I wanted some kind of mystery for them to hunt for the series. I had lots of first start ideas that didn’t gel with me. You should see the Evernote notebook I kept! I don’t even recognize half those ideas now. I thought maybe I could do a “lost fleet” story or an “evil empire” story. All of those ideas didn’t inspire me though. Then I started to read some reverse harem stories on the side of my usual reading. I’ve talked about one of them here, PIRATE NEMESIS. I really loved this idea of multiple romances, where everyone learns to get along, and the dreaded “love triangle” storyline is upended. That’s when it hit me to combine reverse harem with my new world idea! In this story world I’ve created, women are a small minority, so over the centuries, women fought to bring their numbers up and bring their system to parity. There are lots of laws in place to help the cause, including several planets where the land can only be owned by women. My main character, Vivian, had an assured future as the head of her estate when her brother screws over the entire family, and now Vivian is in danger of losing the land, her family, everything. With this story, I’m able to combine a lot of my loves in storytelling: family drama, a tough but lost heroine, a mystery, and several great romances. The Flyght Series has been a lot of fun to write, and that’s the key point here. Whether anyone else ever loves it is secondary because it has brought me a lot of joy. I’ve written the first two books. I’m going to take a break now to write the next Daydreamer book (which I’m also excited for), and then I plan to return to the Flyght Series and write the next THREE books in that series before summer. That’s my plan at least. I’m hoping my Dragon dictation and AlphaSmart will get me there. Today, I have the pre-order available for FIRST FLYGHT on Apple Books, Nook, Kobo, and Google Play! Amazon doesn’t allow pre-order this far in advance. I’m hoping to gain some sales on these vendors. EVERY SALE OUTSIDE OF AMAZON IS IMPORTANT. When you pre-order any place other than Amazon, those sales stack up and then dump on the day the book publishes, giving the book a boost in the ranks. Even only 10 sales at Apple Books could give me some visibility there! So if you buy outside of Amazon, I would love it if you pre-ordered. I’m also doing something different and offering this book for only 99¢ during the pre-order period. I usually launch my books at full price. This time, I want to try something different. I want to give readers every chance to pick up this book and start this series. With a low price-point for the first book, I am hoping more people will pick it up and give it a chance! But get it during the pre-order period because it will increase to $2.99 not long after it publishes. Expected publishing date: September 6, 2019. I know that’s far into the future, but if the writing goes well, I may move the date up! We shall see. But September will give me plenty of time to have 5-6 books of the intended 9 written ahead of time. That would be awesome for nerves. Lol. Cover designed by the awesome Najla Qamber. She’s already designed the first 3 book covers in the series, and I have her booked for most of the rest! 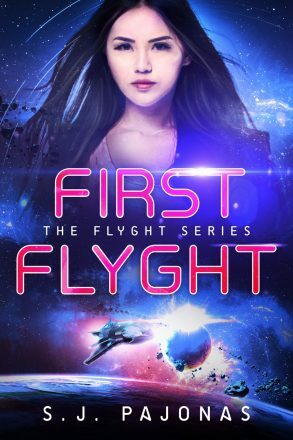 FIRST FLYGHT is the first book in the Flyght Series of sci-fi reverse harem romance. If you like action-packed space operas and a universe full of twists, then you’ll love S. J. Pajonas’s interstellar adventure. Note: This is a slow-burn RH romance. Pre-order FIRST FLYGHT to try your hand at space smuggling today! If you’d like to read an excerpt, I have one available on the FIRST FLYGHT page of my website!